Today's article is the continuation of the topic of Blunders in Modern Play. Last week we went over the examples of opening blunders from the World Cup tournament. Today I would like to concentrate on one example that features the position from a late opening, also taken from the World Cup. GM Shimanov lost the first game of the mini-match against GM Kamsky and needed to win as White. He opened the game with the King's Gambit, which according to my database he had never played before. The King's Gambit does not have a good reputation among the elite, however top-players (who also happen to be very creative players) Ivanchuk, Nakamura and Morozevich experiment with it more often than others. This opening turned out to be an excellent choice against Kamsky, as he knew how to equalize in the opening only up to a certain point and ended up in a worse position out of the opening. "If the score of Shimanov-Kamsky is correct, amazing. You usually only see games go from totally won to lost over & over in kids' games!" In this late opening/middlegame position White has a clear advantage. Black has a hard time to offer something in exchange for his opponent's strong center. White's pieces are harmoniously developed, while Black's are scattered around the board. Moreover, the black kingside pawns soon will become targets. And, like in most 1.e4 e5 openings, the f7-pawn is a real weakness. In combination with the soon-to-be-opened f-file, the black king's position can become very dangerous. The f4-pawn ties White's hands to the kingside, and because of this Black's only chance of counterplay is on that flank. Rh6-Bg4 or g5-g4 are plans to consider. Although at the moment the white king is well defended, White might consider to play Qd3 or Ne5 to avoid the Bg4 pin and in case of Qd3 to target the weakness on b5. Shimanov found a very concrete tactical solution to the position which exploits the weakness of f7. He didn't manage to follow through the plan correctly, but the idea nevertheless is very strong. It is a bit risky as it allows Black to get his heavy pieces closer to the white king. However, I cannot find an alternative where White can exploit his position risk free. White's last move is logical: the queen defends the king along the third rank but at the same time attacks the b5-pawn. However, in the position after the 18th move White had a much stronger solution: 19.Bxf7. I am sure GM Shimanov considered it, and so the question is: what did he miss? If you go over the line shown in the annotations, at one point Black has four pieces and the f4-pawn attacking the white king. The computer evaluates this position as winning for White but over the board it is hard to see whether Black has something or not. It turns out that 23.Rxa5 is a critical move as the queen and the rook along the fifth rank manage to protect the king. 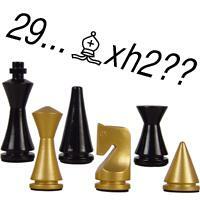 Although 19.Bxf7 is objectively stronger than 19.Qd3, the latter move is more natural and human. White's last move is a terrible blunder. The positional evaluation changes from about +2 to -7! This is as extreme a change can be. It is not easy for White to find a continuation that does not involve the idea of either Nxf7 or Bxf7. However, there is no excuse for playing Rf2 - this move is simply losing! Black does not have a direct threat, so White could have opted for the slower Bd2, for example. After Rf2 Kamsky did not play the queen sacrifice, which White cannot really take due to checkmate in two. With 20...Ng3 Black reversed the positional evaluation back from -7 to +5. I wonder if Kamsky right away noticed 20...Qxh2 after 20...Ng3 had been played. If so, the remainder of the game must have been very painful for him. However, things did not calm down after this, because after winning the piece, White did not find the strongest move 23.Rf1 and ended up in slightly worse position. 31... g2 is a planned move; now Black is threatening ...Rf1. I suspect Kamsky simply missed the defensive idea Rf2, since the pawn moved to g2 and does not control the f2-square. The idea of g2 is to play Rf1 and to win the knight on g1. The knight is pinned, hence if we put some piece on f1, it will be lost. Once can find the idea here easily: it is indicated in the annotations above: 31...Bh3!! - Black adds one more piece to the attack and threatens ...Bf1. If you look carefully at the position, you'll see that the white king finds itself in a mating net! From f1 the bishop takes away the e2 and d3-squares, and therefore Qh6 would be a checkmate - a beautiful geometric idea! In the last part of the game Shimanov masterfully exchanged all the pieces to end up with a winning endgame. Next week we will continue with the same topic and look at some more examples from middlegame positions. Watch FM Elliott Liu's video series Amazing Games for Beginners: Attack the Kingside - Part 1, Part 2, Part 3.